1 C None No Power Seat 1 C is a standard Business Class recliner style seat located at a bulkhead. Floor storage is not available during takeoff and landing. 1 D None No Power Seat 1 D is a standard Business Class recliner style seat located at a bulkhead. Floor storage is not available during takeoff and landing. 11 A None No Power Seat 11 A is an Economy Class seat that may have limited recline due to the exit behind. 11 B None No Power Seat 11 B is an Economy Class seat that may have limited recline due to the exit behind. 11 C None No Power Seat 11 C is an Economy Class seat that may have limited recline due to the exit behind. 11 D None No Power Seat 11 D is an Economy Class seat that may have limited recline due to the exit behind. 12 A None No Power Seat 12 A is an Economy Class exit row seat that may have some extra legroom. Aeromexico classifies this seat as a "Preferred Seat." Selection of this seat is available for an additional fee. It can get very cold near the exits on this aircraft. 12 B None No Power Seat 12 B is an Economy Class exit row seat that may have some extra legroom. Aeromexico classifies this seat as a "Preferred Seat." Selection of this seat is available for an additional fee. It can get very cold near the exits on this aircraft. 12 C None No Power Seat 12 C is an Economy Class exit row seat that may have some extra legroom. 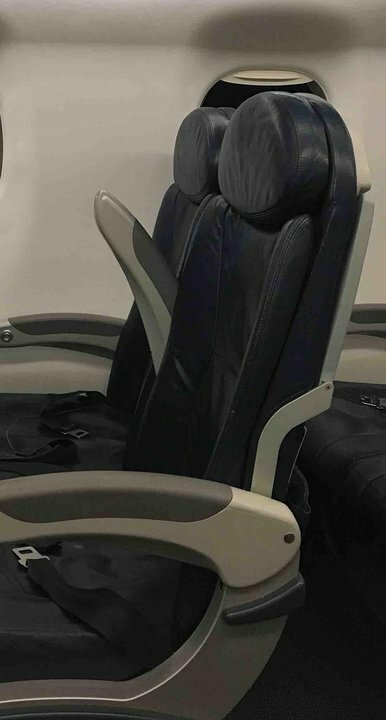 Aeromexico classifies this seat as a "Preferred Seat." Selection of this seat is available for an additional fee. It can get very cold near the exits on this aircraft. 12 D None No Power Seat 12 D is an Economy Class exit row seat that may have some extra legroom. Aeromexico classifies this seat as a "Preferred Seat." Selection of this seat is available for an additional fee. It can get very cold near the exits on this aircraft. 2 A None No Power Seat 2 A is a standard Business Class recliner style seat located at a bulkhead. Floor storage is not available during takeoff and landing. 2 C None No Power Seat 2 C is a standard Business Class recliner style seat. 2 D None No Power Seat 2 D is a standard Business Class recliner style seat. 22 D None No Power Seat 22 D is a standard Economy Class seat that is missing a window. 27 A None No Power Seat 27 A is an Economy Class seat that is in the last row of the aircraft that may have limited recline. The proximity to the rear galley and lavatory may be bothersome. 27 B None No Power Seat 27 B is an Economy Class seat that is in the last row of the aircraft that may have limited recline. The proximity to the rear galley and lavatory may be bothersome. 27 C None No Power Seat 27 C is an Economy Class seat that is in the last row of the aircraft that may have limited recline. The proximity to the rear galley and lavatory may be bothersome. 27 D None No Power Seat 27 D is an Economy Class seat that is in the last row of the aircraft that may have limited recline. The proximity to the rear galley and lavatory may be bothersome. 3 A None No Power Seat 3 A is a standard Business Class recliner style seat. 3 C None No Power Seat 3 C is a standard Business Class recliner style seat. 3 D None No Power Seat 3 D is a standard Business Class recliner style seat. 4 A None No Power Seat 4 A is a standard Business Class recliner style seat. 4 C None No Power Seat 4 C is a standard Business Class recliner style seat. 4 D None No Power Seat 4 D is a standard Business Class recliner style seat. 5 A None No Power Seat 5 A is a standard Economy Class seat located at a bulkhead. Aeromexico classifies this seat as "AM Plus" which provides an additional 4 inches of legroom for an additional fee. The tray table is installed the armrest making the armrest immovable and slightly reducing seat width. Floor storage is not available during takeoff and landing. 5 B None No Power Seat 5 B is a standard Economy Class seat located at a bulkhead. Aeromexico classifies this seat as "AM Plus" which provides an additional 4 inches of legroom for an additional fee. The tray table is installed the armrest making the armrest immovable and slightly reducing seat width. Floor storage is not available during takeoff and landing. 5 C None No Power Seat 5 C is a standard Economy Class seat located at a bulkhead. Aeromexico classifies this seat as "AM Plus" which provides an additional 4 inches of legroom for an additional fee. The tray table is installed the armrest making the armrest immovable and slightly reducing seat width. Floor storage is not available during takeoff and landing. 5 D None No Power Seat 5 D is a standard Economy Class seat located at a bulkhead. Aeromexico classifies this seat as "AM Plus" which provides an additional 4 inches of legroom for an additional fee. The tray table is installed the armrest making the armrest immovable and slightly reducing seat width. Floor storage is not available during takeoff and landing. 6 A None No Power Seat 6 A is a standard Economy Class seat. Aeromexico classifies this seat as a "Preferred Seat." Selection of this seat is available for an additional fee. 6 B None No Power Seat 6 B is a standard Economy Class seat. Aeromexico classifies this seat as a "Preferred Seat." Selection of this seat is available for an additional fee. 6 C None No Power Seat 6 C is a standard Economy Class seat. Aeromexico classifies this seat as a "Preferred Seat." Selection of this seat is available for an additional fee. 6 D None No Power Seat 6 D is a standard Economy Class seat. Aeromexico classifies this seat as a "Preferred Seat." Selection of this seat is available for an additional fee. 7 A None No Power Seat 7 A is a standard Economy Class seat. Aeromexico classifies this seat as a "Preferred Seat." Selection of this seat is available for an additional fee. 7 B None No Power Seat 7 B is a standard Economy Class seat. Aeromexico classifies this seat as a "Preferred Seat." Selection of this seat is available for an additional fee. 7 C None No Power Seat 7 C is a standard Economy Class seat. Aeromexico classifies this seat as a "Preferred Seat." Selection of this seat is available for an additional fee. 7 D None No Power Seat 7 D is a standard Economy Class seat. Aeromexico classifies this seat as a "Preferred Seat." Selection of this seat is available for an additional fee. 9 A None No Power Seat 9 A is a standard Economy Class seat that is missing a window. Aeromexico classifies this seat as a "Preferred Seat." Selection of this seat is available for an additional fee. 9 B None No Power Seat 9 B is a standard Economy Class seat. Aeromexico classifies this seat as a "Preferred Seat." Selection of this seat is available for an additional fee. 9 C None No Power Seat 9 C is a standard Economy Class seat. Aeromexico classifies this seat as a "Preferred Seat." Selection of this seat is available for an additional fee. 9 D None No Power Seat 9 D is a standard Economy Class seat that is missing a window. Aeromexico classifies this seat as a "Preferred Seat." Selection of this seat is available for an additional fee. 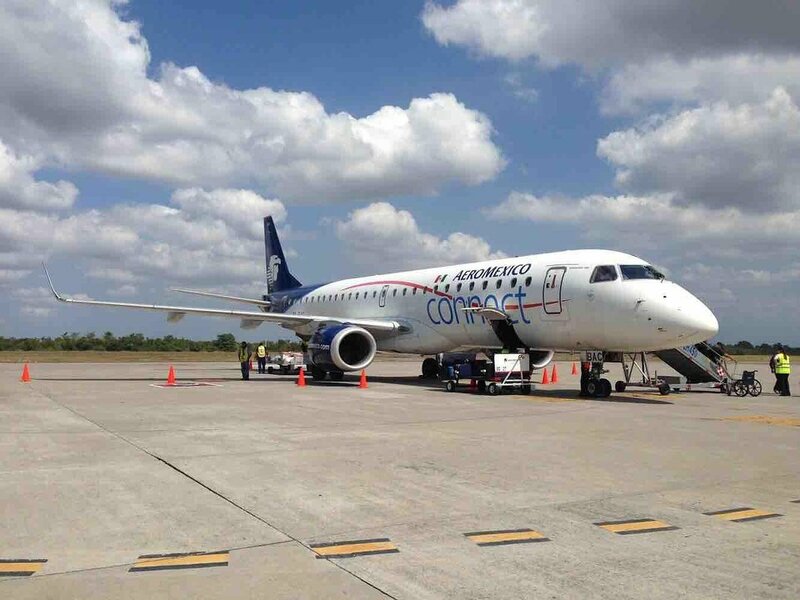 This Aeromexico ERJ-190 is operated by Aeromexico Connect. The aircraft is flying on short-haul routes with 11 Clase Premier Business Class seats and 88 Main Cabin Economy Class seats. AM Plus seats in row five, which provide four inches of additional legroom, are available for purchase. 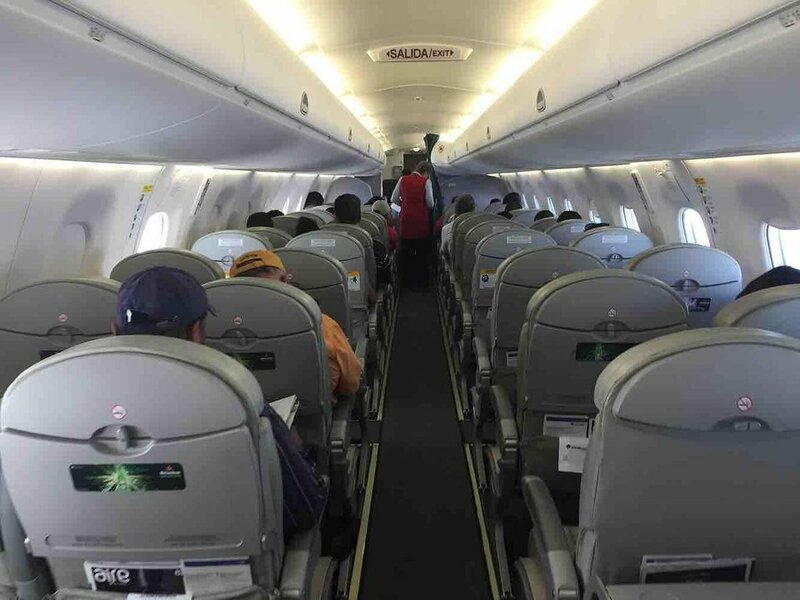 This regional jet receives accolades from flyers who find the seats to be very comfortable, the windows to be large, and the ride to be quiet. MEX-VSA. The only issue with this seat is that it does not have full recline due to it being ahead of the exit. The entire plane is ridiculously loud. The bathroom is not only way at the back, it is also tiny, to the point where I avoid using it at all costs. Fortunately the flight is not that long. Be aware that the biz class seats are just about as wide and only have slightly more leg room then economy. Seats C and D in biz class, are a bit wider then seat A, though if you choose an A seat you get both aisle and window. 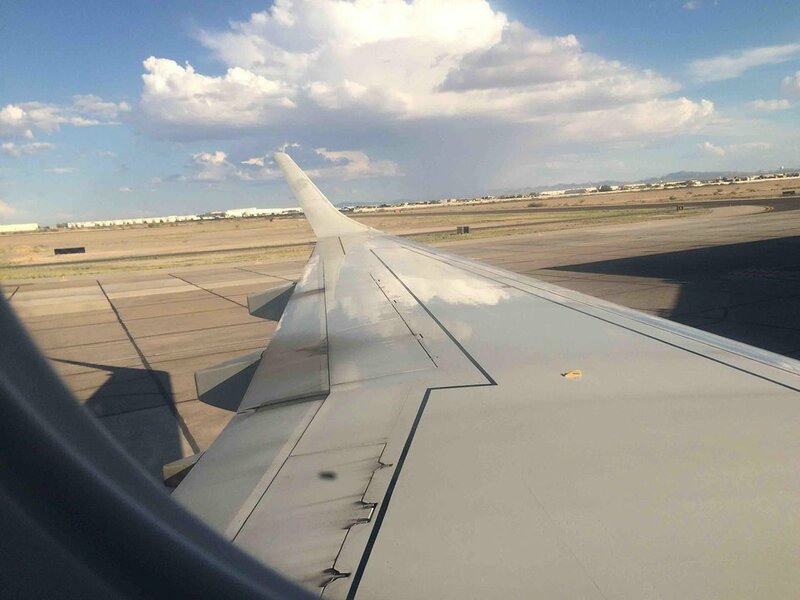 The E190 plane is bigger than the E175 thus the window is not aligned but I used that to my immediate advantage given the fact that you are able to lean on the wall and take a nap without leaning against a glass window. The proximity to the bathroom is a plus but given the fact that this is such a smooth flight you might just decide to sleep altogether. My first time flying on this type of craft and I was a bit nervous since this is smaller than the A320 and became a little anxious when I saw seat 20D is in the very last row right before the lavatory. I was soon taken back by the over smoothness of the flight and very little noise altogether. The seat actually does recline a bit so it was somewhat comofortable. Truly enjoyable experience. 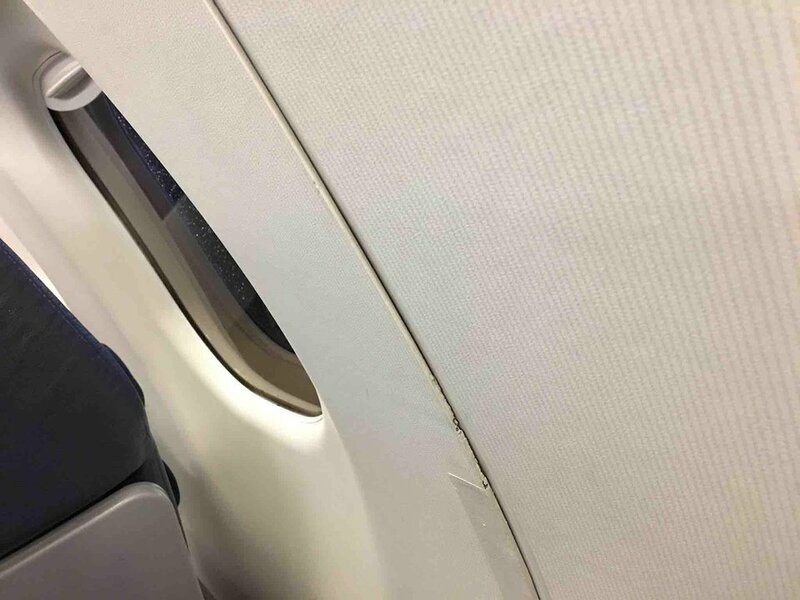 It is true that most of the rows on the E190 are missalligned with the windows. Row 18 is one of the few where the seats and windows are actually alligned.